George Smith, "Furniture Draughtsman to His Majesty", produced an incredible volume of Plates in 1826 "comprising instructions in the elementary principles of Ornamental Foliage enabling the student to draw with facility and correctness in this so generally useful branch of the Art." Of course I had a camera hidden in a loaf of bread when I went to study these fabulous engravings. I guess I could have bought a copy online for $2,750, but I'm still holding out for a time-machine so I can buckle up my pantaloons and race down to Jones & Co. in London with a shiny new Guinea in my purse to purchase a copy of Mr. Smith's new and "elegantly colored" hand-engravings, fresh off the press. I'm including here his engravings of the Acanthus as Part V in an ongoing series describing how to draw the Acanthus and other ornament. In this instance we'll take a brief look at how to lay in the shadows. Fig. 1 shows the delineation of the outline of the Acanthus ornament. The design is taken from an example of the Corinthian Capital as existing in the arch of Titus, in Rome. Of note is the calligraphic quality of the line. Though it was copied from a stone carving, Smith has rendered his ornament with fluid, organic lines. I also love how carefully he delineated the flutings (a,b and c)and the principal fibres of the stem. Having prepared three tints necessary for painting the shadows, according to value, Figure 2 shows us how the first (or lightest value) of these shadow tints is laid in. Using a full brush, Smith washes the broad shade of the leaf from the turnover. Note how the same shade is used to also wash in the broad shadow cast outside the leaf. Proceeding to his second shadow tint in Figure 3, Smith continues to lay on his shadows. We can see that he omits tinting the projecting parts such as the stems and fibres of the leaves under it's shadow, as marked in Figure 3 above as 1,2,3 and 4. Smith reserves his darkest shadow value for the tight whorls of the leaf, and narrow areas where the fibrous stems are closest together. Use dark shadows sparingly, or your grisaille ornament painting will appear stiff and angular. Remember that we're painting foliage not stone, in this case. Also notice that there is reflected light cast from the background onto the left side of the leaf. Smith omits painting his darkest shadow tint on these areas to render the effect of reflected light. 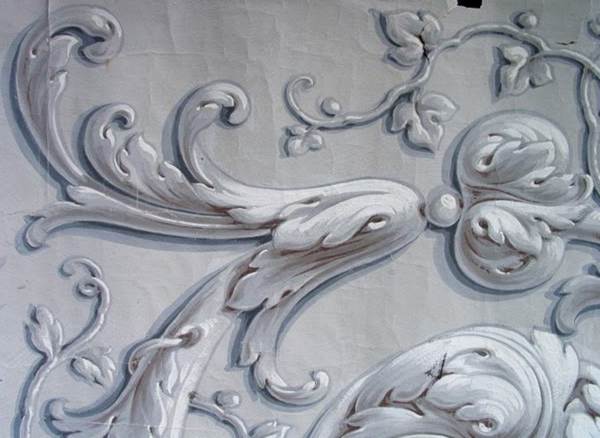 Used in combination with this post showing painted examples of grisaille ornament from that era, you should be able to see clearly the steps involved in the painting of this type of ornament. Below is a beautiful example (from that post) of the technique described above, with the added inclusion of a painted highlight. You can clearly see the steps involved as described by Smith to create cast shadows and reflected light with no more than three or four shadow tints and a fifth highlight. Your participation is always wonderful. You always teach and we always learn here. "I'm coming to an understanding of the importance in patterning. determines the success of the work. Here it is in another formatt. Post if you like? Acanthus is one of the hardest form for sculptors too. I think a very important aspect for both painters and sculptors is never forgetting the underlying patterns of the ornament. It's all to easy to get caught up in small details and forget to have those details sell the overall pattern of lights and darks. If the pattern is well laid out (and understood!) the details can only go in the right place." I agree with you, Patrick. There's a very formulaic approach to building up the painting in Smith's work, but I feel that it is a necessary way to work. If I dont build up the design methodically like this, I find that I end up focusing too much on detail. An over-emphasis on fine detail ends up obscuring the underlying structure. i think i have a real fear of contrast (so many years of doing subtle and fake-old have dulled my skills a bit!) studying this stuff really helps-- thanks so much for sharing this book alan! Great post Alan...and well put Patrick. I struggle with keeping the overall pattern clear. The pictures show how formulaic it truly is. I tend to get in there with a brush and get caught up with the strokes and lose some of the pattern. The comments about overall pattern struck me as interesting because there have been occasions when that same slip-up (attending to details too early) has applied to portraits I've painted. Thanks for linking back to the earlier post, too! "The Ancients never did it without method." just saw your blog, great help! many thnx and pls do keep it up! Goodness, what a wonderful blog..thank you so much for this very thoughtful post! Nachiket Group supply Volute Press at best price. We provide Volute Press in pune, India at cheap cost. It is one of the best Volute Press manufacturers in Pune. Thanks for posting the excellent information. Nachiket group is supply best Composting Machine, Garden Shredder, Sanitary Napkin Incinerator, Volute Press, Drum Composter, Green Waste Processer, Organic Waste Composting Machine, Food Waste Converter and Organic Waste Converter at cheap cost in Pune, Maharashtra. Your information is really awesome as well as it is very excellent and i got more interesting information from your blog Garden Shredder.